Commander John Bennett Herrington was just 8 years old when he dreamed about being an astronaut. 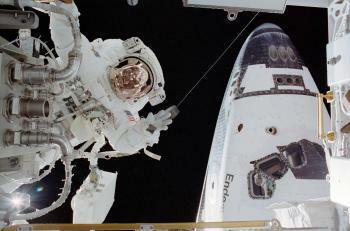 “I never thought that I could actually accomplish it,” recalled the space shuttle veteran, who logged over 330 hours in space when he flew on Endeavour mission STS-113 to the International Space Station in 2002. Mr. Herrington spent nearly 20 hours of that mission on three spacewalks to install and activate equipment along the truss structure outside the station. The third spacewalk planned to involve riding Canada’s latest-generation robotic arm to manoeuvre to different work sites. 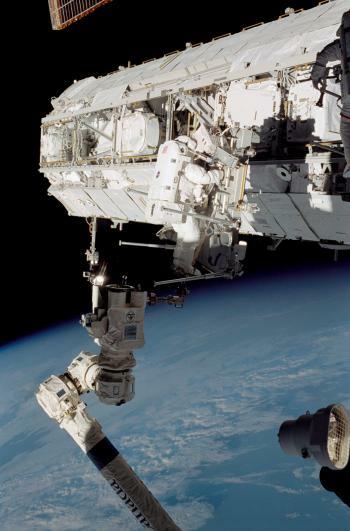 But the mobile transporter that was to bring Canadarm2 down the track got stuck, leading to a change of plan. Those are some of the remarkable experiences Mr. Herrington will share with Canadians at a Toronto symposium on Dec. 10. Held at Centennial College, the event marks Human Rights Day and is dedicated to discussion about the future for Aboriginal people. As a member of the Chickasaw Nation of Oklahoma and the first Native American astronaut, Mr. Herrington is an inspiring role model. 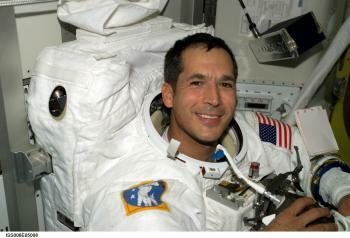 To honour his heritage, he carried a Chickasaw Nation flag on his shuttle mission. “I think native kids are probably the most natural scientists, engineers, in existence. Their ancestors have had to solve engineering problems for millennia without western science methods,” he said. Mr. Herrington serves as special advisor to the National Institute for Space, Science and Security Centers at the University of Colorado at Colorado Springs (UCCS), his alma mater. He is also chairman of the board for the non-profit American Indian Institute for Innovation (AIII) in Rapid City, South Dakota. AIII wants to build a preeminent school based on a successful model of the GEAR UP program in the U.S. Its implementation in South Dakota focuses on preparing American Indian students for success in college. The school would produce American Indian professionals, especially in the fields of science, technology, engineering, math, and healthcare, and encourage them to help improve tribal communities’ quality of life. Like Aboriginal Peoples in Canada, in the U.S. some tribes are very prosperous while others are “far worse off,” said Mr. Herrington. Among many challenges, American Indians struggle with greater poverty, higher infant mortality, higher unemployment, and lower median income than the general U.S. population. AIII cites a high school graduation rate of 51 percent for American Indians, with only 46 percent for males. Moreover, American Indian students score lower on standardized tests in reading and math than their national counterparts. To find more ways to help native students graduate from high school and succeed in college and beyond, Mr. Herrington is returning to school himself—to get a PhD in education. “What I share with kids is that you can have a dream, you can have struggles, but you can overcome those struggles through perseverance and the right mentors in your lives and [by] making good decisions,” said Mr. Herrington. His own “trials and tribulations” had to do with education. Because he wasn’t interested in school and didn’t study, he ended up dropping out of college. He started working in the mountains instead, following his passion for rock climbing. First there was the supervisor he worked for on a mountain survey crew who convinced him to go back to school. Then there was the retired navy captain he tutored at UCCS who used to fly airplanes in World War II. He convinced Mr. Herrington to join the navy and become a pilot. “I had flown as a kid but I never thought about taking my college degree and going off and being a pilot. It was that motivation, in a very simple short period of time, I thought, I’m capable of doing that,” he said. After graduating in 1983 with a bachelor’s degree in applied mathematics, he joined the navy. He realized there that he really liked flying airplanes and using his math background to learn how to build better planes. Alan Shepard, first American in space; John Glenn, first American to orbit the earth; Neil Armstrong, first person to set foot on the moon—they and many of his astronaut heroes were test pilots, he said. He often saw these American heroes on TV as a child since he was born in 1958, the same year NASA came into being. The Soviet launch of Sputnik I had occurred the year before, sparking the beginning of the space age. After completing a master’s degree in aeronautical engineering at the U.S. 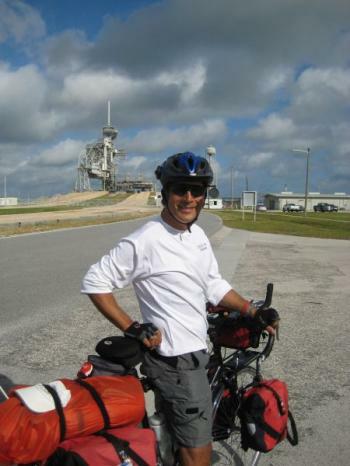 Naval Postgraduate School in 1995, he applied to NASA. Selected in 1996, he was in the same class with Canadian astronauts Julie Payette and Steve MacLean. Mr. McLean is now president of the Canadian Space Agency. Mr. Herrington left NASA in 2005 in order to pursue private space flight and a chance to pilot a one-of-a-kind “Spaceplane.” Although in the end the company he worked for was unable to finance the project, it was an opportunity he could not pass up. Finishing that stage of his career led him to accomplishing his next challenge. Already actively working for his tribe and with students to promote studies in math and science, last August to November Mr. Herrington embarked on a three-month, 4,000-mile bicycle trek across the country to reach more children. He wants kids to understand that something they think is out of the realm of possibility may actually be achievable, such as becoming an engineer, a scientist, or an astronaut. “You just have to recognize your own capabilities,” he said.